This is the first decorating project in our house. My son's bedroom was the first room to receive a make-over. He is 8. 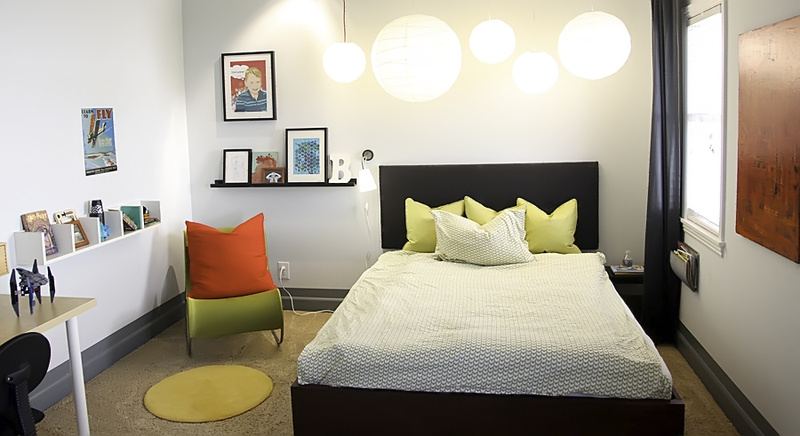 The center piece/focal point of the room is the bed. I wanted a queen size bed (60x80inches) so that this room can double as extra sleep space if we have house guests beyond what the guest bedroom can fit. Also I wanted a trundle to pull out with a twin size matress (39x77inches). We built the bedframe out of 1x12, 1x8, 1x6 and 1x2 lumber. The slats - Sultan Liared and the trundle - Odda pull-out bed frame we bought at IKEA. The trundle has a white front piece which we cut down. Use masking tape to tape the line you cut to avoid ripping the laminate. Then we added our own board that was stained to match the rest of the bed. The top of the sawed laminate was finished witha 3/4 inch quarterround, also stained. There is a midbeam to hold the slats which came in a set of two. I added darkbrown felt to all sides where wood would touch wood without glue to avoid squeaking and that worked really well. We used bed rail fasteners. to attached the sides to the head and foot board. Rockler was a really great store to order from. Very thorough customer service and fast shipping. I also happened to call during a free shipping special. Yay! Paint: I used Lowe's Olympic low voc primer and paint for his room and it was really nice to work with. Great coverage - and practically no smell. And here it is pulled out and ready for a sleep-over. This room now has room for three people to sleep! I like that a room has the potential to do double duty like that because it saves space and makes the house much more functional and flexible. The headboard is mounted to the wall and is a sheet of plywood from the hardwood store with three holes drilled through it for tufting. Then it has a frame on the back for straigthening out the sheet as well as providing it with room for the bracket that is used to secure it to the wall. I added a sheet of 1 inch foam, two layers of batting and some heavy duty upholstry grade fabric in a charcoal grey. We R Fabrics also has exceptional service. Definintely coming back! The tufting is made with coverable buttons and wire which is fastened to the back around some wood dowels. The button kit comes with a template so that it is easy to figure out how big to cut the fabric. Then just fiddle with it until the fabric is caught on the little teeth all the way around and clip on the bottom piece. It took me less than 10 minutes to make the three buttons I needed for this project. The desk and wall shelves are from Ikea, as is the rug and lamps. Track system with spot light lamp. The air plane plaque was found at a tourist trap for about 11 bucks or so in Seaport Village in San Diego. It reads: Learn to Fly! This article: B's Bedroom first appeared on http://ahomefordesign.com.